Obvious and understandable motion and storyline. The horses on Cinderella's Carousel go up and down and around in a predictable way, so your child knows what to expect when he climbs into the saddle. Dumbo the Flying Elephant (Magic Kingdom): Dumbo sits in the heart of Fantasyland and is absolutely adored by preschoolers and toddlers. Now riders can take a magical but gentle ride on one of two sets of "flying" elephants (they move in opposite directions), and you can control how high your Dumbo goes. Tip: Dumbo is such a hit with the preschool set that you need to ride it early. Make this one of your first stops to make sure you get a chance to ride without a long wait. Prince Charming Regal Carrousel (formerly Cinderella's Golden Carrousel) (Magic Kingdom): Your preschooler will love the sensation of riding a "real" horse on this old fashioned merry-go-round. The horses come in a variety of sizes — little riders may prefer the smaller versions, located towards the center of the ride. Cinderella's Golden Carrousel runs throughout the day, and with 90 horses, there is usually only a short wait to ride. Tip: If one of your kids is unable or unwilling to sit on a horse, there is a carriage with bench seats on the ride as well. The Barnstormer at Storybook Circus (Magic Kingdom): If your child is feeling brave, and wants to try a "big kid" ride, head on over to Goofy's Barnstormer, located at Storybook Circus in Fantasyland. This ride is very short, with some fun twists and turns that aren't too scary. Not only is this ride fun, but it is a great chance to see if your child is ready for some of the bigger rides at Disney. Parents should note that the Barnstormer has a height requirement of 35". 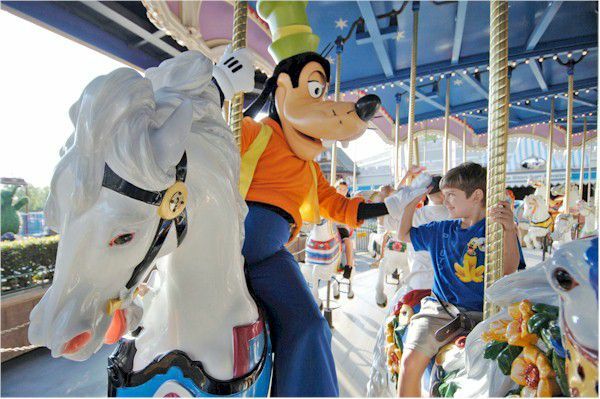 Tip: While this ride is adored by toddlers, adults over 6 feet tall may find the seating to be a little cramped! The Monorail: While this isn't technically a ride, kids of all ages love to ride the monorail. If you are staying in a monorail resort, you will have plenty of opportunities to ride. Not visiting a resort? You can still take the monorail from the parking lot to the Magic Kingdom, or from the Magic Kingdom to EPCOT.Tip: Regarding the monorail as one last "ride" is a great way to get the kids to leave the Magic Kingdom at nap time. "Who wants to ride the monorail?" is much more fun than "Time to go home" for most kids! Kilimanjaro Safaris (Animal Kingdom): Head over to the Animal Kingdom for a close look at some of the most exotic creatures you will ever see in person. This ride lets you get a good look at some of your favorite animal friends in their natural habitats — but hold on tight, it is a little bouncy! Disney adds a special touch by allowing riders to help save one of the baby elephants from "poachers." Preschoolers will enjoy seeing real animals and the adventurous storyline. Tip: Bring along a kid-sized camera and let your child snap his own photos of the animals. TriceraTop Spin (Animal Kingdom): Similar to Dumbo's ride, this one features cute and friendly dinosaurs as the ride "vehicles." Preschoolers love this ride, and it usually has an extremely short line. Tip: This ride has very little shade (which may be why there is often no wait to ride). Ride early in the day or in the late afternoon to avoid the heat. Disney Junior — Live on Stage! (Hollywood Studios): This attraction is not a ride at all — it is a show that combines a live performance with state of the art puppetry and fun effects. What does that mean to your toddler? A chance to see their favorite Disney Junior characters and friends from the Mickey Mouse Clubhouse, and new friends like Doc McStuffins and Sofia the First, live on stage. This show is interactive, so your preschooler will have the chance to dance, clap, and sing along with Mickey and friends. Tip: Look for a character meet and greet right outside the exit of this attraction. You can usually catch Doc McStuffins or one of the Little Einsteins signing autographs and posing for pictures after a performance. The Boneyard (Animal Kingdom): This oversized play area is designed to give your toddler a place to roam and run off some excess energy. Your little one is sure to enjoy some of the tunnels, slides, and net elements as they climb and explore — and, there is a large sandbox-style area where children can excavate "bones." Tip: Have an adult accompany kids under five on the multi-level play area. Children of this age have the strength and dexterity to climb up the nets but may lack the confidence to climb down unassisted or be too scared to enter the enclosed slides. Journey into Imagination with Figment (Epcot): Preschoolers will enjoy both the lively images and storyline of this whimsical ride. Figment’s antics are sure to draw a giggle or two, and the Imageworks play area is a big hit as well. Tip: Want to cool off on a hot day? Head over to the Imagination Pavilion. There is usually little or no waiting to enjoy the ride, and you can spend some time in the air-conditioned Imageworks play area after riding. The Seas with Nemo & Friends (Epcot): Nemo is missing — can you help bring him home? This ride combines elements from Pixar's Finding Nemo film with some of the coolest real live sea creatures around. Spot dolphins, sharks, and even a sea turtle as you make your way through the sea, and search for Nemo. Tip: After the ride, check out some of the smaller tanks, which host a variety of exotic and colorful sea life, and spot a real live Nemo!